As the ÖBB cut back services on the Ybbstalbahn, the end of the line from Keinberg to Lunz am See now sees museum trains run regularly. This video looks at services on both lines, with timber traffic and passenger traffic on the ÖBB operated line, and all the steam locos on the muesum line are seen in action. 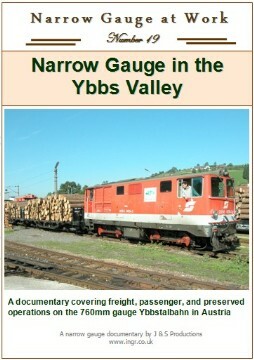 The DVD includes much extra material such as separate menus for the track plans and views of the major stations, views of the locomotives in operation, and many types of rolling stock in use. Price including postage to UK: £15.00, for Europe outside of UK: £16.00, and for the rest of the world: £17.00. In October 2004 on of the line's 2095 locos heads into the short tunnel near Opponitz. Shortly after leaving Grosshollenstein a timber train heads back to Waidhofen. Before leaving Grosshollenstein there is always 30 minutes of shunting to assemble the train for departure. Nearing Waidhofen a pair of the 5090 railcars cross the Ybbs river in May 1997. There are still two loco hauled passenger trains per day. This one is seen crossing the well known bridge in Waidhofen town centre. A double headed train on the way to Keinberg on the preserved stretch of the Ybbstalbahn. This section is known as the Bergstrecke. In Lunz an See, on the left YV2 has brought in a steam special from Waidhofen, while Molln, arrives with a train from Keinberg. One of the 2095 locos is ready to depart from Lunz am See with a preserved deisel on the right. Uv1 is prepared for duty at Keinberg in October 2004. The remains of one of the older 2091 diesel locos is found in the former timber siding at Lunz am See on 2004. Yv2 the Krauss 0-6-4T loco based at Waidhofen hauls a special from Waidhofen. Until recently timber traffic was hauled from Lunz am See. In 1997, the weekly timber train shunts the loaded wagons prior to departure.